Leading off this week’s column: Shorter hospital stays mean more comfortable patients and happier customers. TE Connectivity’s post about their work with smaller devices shows how advancing technology can attain these goals. Staying on the healthcare topic, this Fashion Seal HC post fills us in on who are the most important people to know in the healthcare industry. Has your office ever broken out into an impromptu dance competition? That’s just one of the 17 activities for motivating employees to be found in this interesting post from Workrite Ergonomics. What was the beverage of choice for people in the ancient Iron Age? According to this informative post from Agilent Technologies, “grog” was the popular thirst quencher. It may be the end of the summer, but it’s still hot enough for a dip in the pool…even if it’s a cardboard one. This Make: post checks out an unlikely way to cool off. And we close out this week’s column with our post about our newest vendor: INSIZE. by Carissa Harris, Marketing Communications Coordinator, Sovella, Inc. In Carissa’s first Guest Blog for the Q Source Resource, she focuses on how you can create an ergonomic workspace. Proper ergonomics play a vital role in workplace productivity. When it comes to productivity and efficiency in the workplace, proper ergonomics play a vital role. A workplace that focuses on the well-being of their employees will find an increase in their output, leading to greater profit. Ergonomics is about more than just posture and arm reach. It takes into consideration all aspects of a worker’s movement, eyesight, noise level, and more. By having all components and areas in easy reach and at comfortable distances, it minimizes the amount of bending, twisting, and reaching workers need to make, and consequently reduces strain, stress, and discomfort, leading to a more relaxed positions and greater efficiency. Research and Develop a Plan of Action – Implementing a proper, ergonomic workplace requires research into the correct products for your company and your employees. Understanding the fundamentals of ergonomics will help when it comes time to selecting the best products for your environment. Creating a plan of action ahead of time will also reduce the risk of purchasing products that will not benefit employees in the long-term. It can be beneficial to look to other companies with ergonomic environments and see how you might replicate their successes. Conduct Interviews with Employees and Observe Their Behaviors – To see where you have fallen short in the past, conduct interviews with employees and review any prior injury reports. This will provide the insight into the current problems and assist you in purchasing the right equipment in the future. Some risk factors in ergonomic-poor workspaces include: awkward postures, over-exertion, straining eyes, poor ventilation, and improper lighting. These can lead to worker injuries, including carpal tunnel syndrome, muscle cramping, slipped discs, and tendinitis. Understanding these risks and injuries will lead to better purchasing decisions and happier staff. Gather the Team – Getting everyone on board will make the transition to ergonomics smoother and quicker. Employees will be open to the change when they are informed of the benefits, including less stress and strain. Should employees be sitting or standing for their particular work? Or given the option for both? Tasks with little lifting or reaching may benefit from sitting with the option to stand, while jobs that require heavy-lifting, continuous movement, or parts retrieval will benefit from standing with the option to rest. Height-adjustable benches and proper seating are essential. Is the bench surface correctly positioned and does it cater to various heights? Body size and leg space are factors to consider. Which style of chair is best? Comfort and adjustability are important in choosing the best chair for the job. A chair that is ergonomic will be adjustable to accommodate all body types. Are the monitors in the correct position? Consider viewing angle and distance. Screens should be well lit and in focus to prevent strain on the eyes. How does lighting affect work? Shadows, brightness, even color of light can affect the well-being of employees. Proper lighting can prevent headaches and fatigue. Consider keyboard distance, reach distance for tools, placement of equipment, ventilation, etc. Managers should also encourage good posture and breaks to avoid strain, tension, and fatigue, as well as stretching. Remember, all employees are not created alike, and body type should be taken into account. Be Sure Vendors Can Meet Your Ergonomic Needs – Choose furniture that can be properly adjusted and explore customizations to best suit your employees. Vendors should be able to demonstrate the functionalities, calculate benefits, and give references. Think about long-term use, and pick a sustainable option. Select a vendor that provides the best solution in a timely manner, with the best support. Happiness is the Goal – Quality workspaces make for happier employees. If they feel better, they will perform better, in turn boosting your productivity and profitability. Ergonomic-rich environments have employees that take fewer sick days, report fewer injuries, and are over-all more satisfied. Measure and Improve – Understand how employing ergonomics has improved productivity, reduced injuries, and created a happier staff. Compare output before and after, and survey your employees to determine any improvement and increased happiness. It is important to evaluate the workplace and make improvements as needed. By continuing to improve, you will continue to develop a better system that continues to function and produce at the highest possible level, founded upon proper, modern ergonomics. An ergonomic-friendly workstation project takes an initial investment of research time, budget, customization, and more, but turns those investments into an opportunity for business growth. By using baseline data and key performance indicators (KPIs) to analyze your investment decision (both before and after), you’ll be able to justify the effect ergonomics has on employees and their work. You can also start small and increase investments with proven results paving the way to continue. Great tips, Carissa! Thank you for providing a solid plan to implement ergonomics into the working environment. We look forward to learning more about the topic and how Sovella can assist in such an implementation. For information about Sovella ergonomic workspace products, or to place an order, please visit QSource.com. You may also contact us via email or phone at 800-966-6020 and we will be happy to assist you. 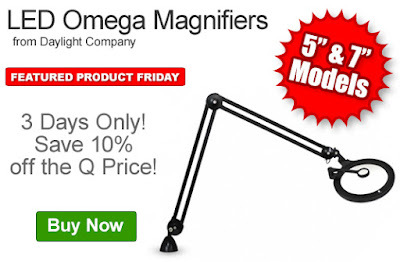 Get 10% off the Q Source price of Daylight LED Omega Magnifiers. Our FPF082616 Coupon Code is auto applied when you add an eligible magnifier to your shopping cart. This Featured Product Friday (FPF) promo is valid from today, August 26, 2016 through Sunday, August 28, 2016 and the code is unlimited use. Omega LED Magnifiers are available in 5” and 7” models and feature two levels of brightness. Each model also has a sturdy and flexible internal spring arm. For further questions about Featured Product Friday, please read our informational blog post, call us (800-966-6020), or send us an email. 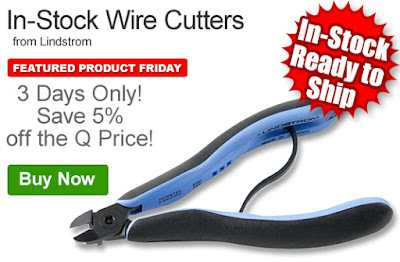 Please note: This promo is valid only at QSource.com and expires on August 28, 2016. 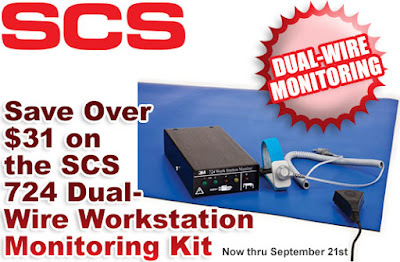 Get everything you need to protect your workstation from static and save an extra $31 with our SCS 724K-WM11 Dual-Wire Workstation Monitoring Kit promo. This limited-time offer runs through September 21, 2016. This workstation monitoring kit includes the 724 Dual-Wire Workstation Monitor, 2368 Dual-Conductor Fabric Wrist Band for Monitors, 2360 Dual-Conductor Ground Cord, and 8811 Dissipative Blue Rubber Table Mat. This is a ready-to-use kit that includes all the basic tools needed to create a static-safe workstation. Take advantage of this special savings and get your 724K-WM11 Dual-Wire Workstation Monitor Kit for just $236.84. This offer expires September 21st, 2016. You may also contact us via our Web site, phone (800-966-6020), or by email. Leading off this week’s column: With the Olympics in the news, this R&R Lotion post about why the top four golfers in the world have passed on Rio is a very interesting read. Desco’s post presents new information that claims ESD was to blame for the sinking of Gus Grissom’s spacecraft. This important post from Brady reminds us that OSHA’s fines for safety hazards have increased for the first time in more than 25 years. Workrite Ergonomics’ post about McDonald’s removing some artificial preservatives from certain menu items will change your mind about whether or not you’ll dine at the fast food giant. Here's a handy post from Instructables for those times when you’ve accidentally drilled in the wrong spot. And we close out this week’s column with our post about Brady’s New BMP61 Labeling System. We’re excited to announce that Brady’s new portable printer, the BMP®61 is now available at QSource.com. 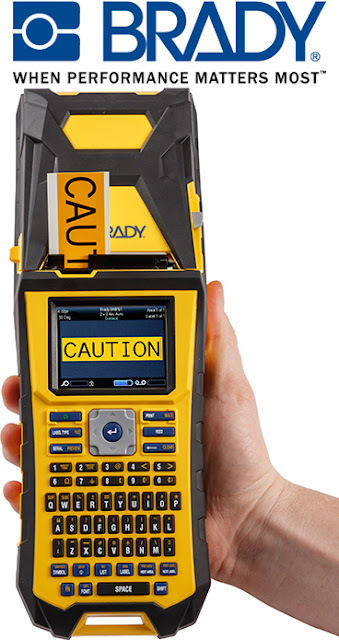 The Brady BMP61 Labeling System provides quick, efficient, professional-level on-the-go printing of labels for wire, cable, and component identification. The printer features an easy-to-use, large color touch-screen and a QWERTY-style keypad. Those features, combined with its 300-DPI print head and automatic label formatting, allow you to create crisp, durable labels in no time. This versatile printer is compatible with a number of materials (and can use most of the same material parts as the TLS2200 Label Printer). Materials are easy to load and remove thanks to an improved wider, more open loading bay and door. The Brady BMP61 Labeling System is available in standard and WiFi versions. A number of available accessories include a hardcase, carrying strap, magnet, battery cover, and a cutter. Shop QSource.com for the complete line of BMP61 label printers, accessories, ribbons, and labels. You may also contact us via our Web site, phone (800-966-6020), or by email. Get 31% off the MSRP of ACL Staticide’s 8602 Precision Rinse NF 11 oz Spray. Our FPF080516 Coupon Code is auto applied when you add an 8602 can to your shopping cart. This Featured Product Friday (FPF) promo is valid from today, August 5, 2016 through Sunday, August 7, 2016 and the code is unlimited use. 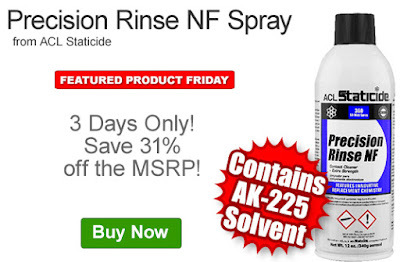 ACL’s Precision Rinse NF is an ozone-safe, extra strength cleaner that contains the AK-225 solvent. The 8602 product cleans quickly, dries fast, leaves no residue, and is non-flammable. For further questions about Featured Product Friday, please read our informational blog post, call us (800-966-6020), or send us an email. Please note: This promo is valid only at QSource.com and expires on August 7, 2016. Leading off this week’s column: Agilent Technologies’ post looks at one reason why cows may be sacred…they pee gold! 3M’s post shows us the wonderful combination of beer and science. Mars and lasers! This National Nuclear Security Administration post about NASA’s Curiosity Mars Rover being able to fire its own laser kind of sounds like something out of sci-fi…and we love it! What a difference three years can make! Mashable checks out 10 of the coolest technological innovations since 2013. 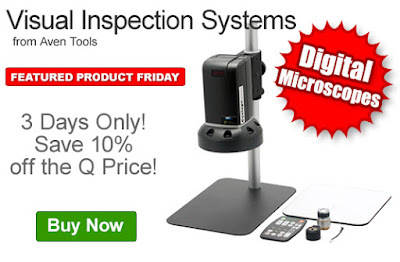 And we close out this week’s column with our email post about a hot, new Mantis Microscope promotion from Vision Engineering.